Destroy the competition with the CyberpowerPC Gamer Xtreme Desktop PC. It is designed for those who needs reliable desktop pc at an affordable price. This Gaming Desktop helps you power through to intense gaming sessions with utmost ease. It is operated by 9th Gen Intel Core i7-9700K 3.6GHz 8C processor to improve productivity and redefine multi-tasking to a greater level. Equipped with a 16GB DDR4 memory to deliver fast system response and ensure lag-free operations. Its 240GB SSD+2TB HDD storage capacity provides massive storage space for huge files, so that you can store important digital data and work your way through it with ease. With its lightweight design, this desktop pc gives you the performance to get things done wherever you are. It comes with Windows 10 Home 64-bit operating system software that helps you to manage your devices and identities in a way that will aid you more with your needs. 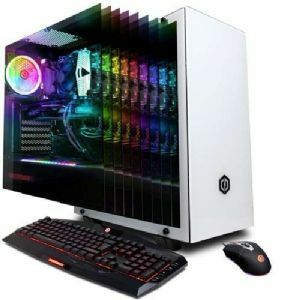 Buy the CyberpowerPC Gamer Xtreme Desktop PC now! CyberPowerPC logos are registered trademarks of CyberPowerPC. All others trademarks and copyrights mentioned herein are the property of their respective owners.